Would you like to install a Molecular Playground at your location? You can and it's relatively inexpensive. Please stay tuned at this site for detailed installation instructions. In the mean time, the information below should give you an idea of what is needed for an installation. The software will soon be freely available for download at this site (in the mean time, contact one of the developers). It is easy to configure - expertise not required. *To clarify, this is a "build-your own" project. This web site and project does not sell hardware, but merely makes the software freely available. Potential vendors above are merely suggestions. As you can see above, the projector, screen, and installation costs will vary significantly with the nature of the site. A large site with excess ambient lighting, for example, will require a projector with a high lumen (intensity) count, while a site in a more protected space could make do with a very modest projector. The Molecular Playground is optimized for a 1024x768 projection, which is accessible from reasonably inexpensive projectors. The projection surface is typically a light-painted wall, but there are specific paints designed for "paint on" projections surfaces (gray is actually preferred to allow both for bright whites and deep darks). Installation requires mounting of the hardware and the delivery of an Ethernet connection (wired or wireless) and (modest) AC power. As shown at right, an ideal installation has the projector and Kinect sensor mounted on or near the ceiling, projecting the image over the heads of the participants. This is not necessary, but will limit shadows that unaesthetically block part of the image. The choice of projectors is wide and varied. One desires a projector that can handle being on continuously for the intended projection period, is easily mounted (to the ceiling, for example), and can project up to 1024x768 (XGA) resolution. Most importantly, the projector must be able to overcome ambient lighting, which will vary widely with the installation. The best approach is to bring demo projectors to your site and try them out. The first Molecular Playground is driven locally by a 2.4 GHz Intel Core 2 Duo Mac Mini w 2 GB RAM. Faster computers will allow for smoother molecule rotation (particularly for large molecules), but this vintage computer has worked well to date. The software and cached content require only minimal hard drive sizes. To save lamp life, one might want to turn the projector off at certain hours. This should not be done with a simple AC timer, as projectors like to have a 1-2 min cool down period with a fan running. So either a person should turn the projector on and off or you should look into projectors that are programmable to turn themselves on and off. The latter are not that hard to come by, but do your own research. 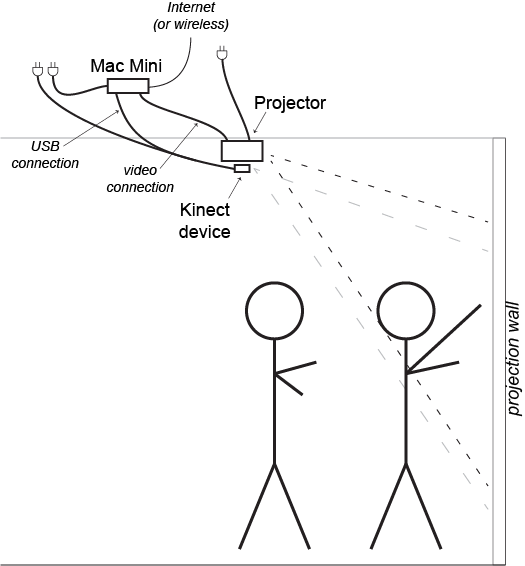 The projector and the Kinect device are ideally mounted near each other, though this is not strictly required. Either can be mounted right-side up or upside down. The computer needs to be located near enough to the projector to have a video connection to the display (typically, VGA or HDMI, although there are newer wireless ways to have some projectors connect to the computer). Fortunately, the Mac Mini is very small and there are mounts that can be purchased to position the Mac Mini most anywhere (security against theft or tampering will be your primary concern). An ethernet connection (wired or wireless) to the computer is required for content updates (although in the event of a network outage, the playground will still operate normally from locally cached content). The computer obtains all Molecular Playground content updates by initiating contact with the server at UMass via a standard WEB connection (port 80). So it can be placed behind a very secure firewall, if desired.